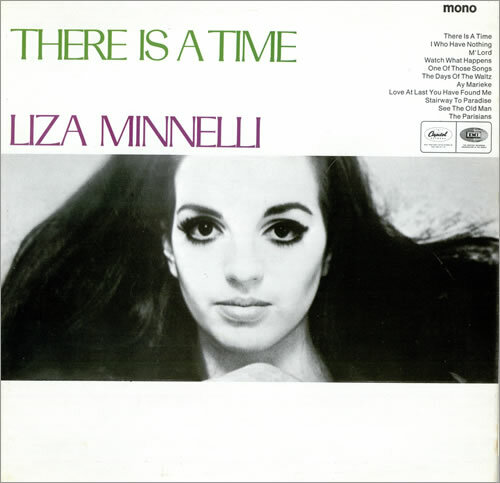 This page is devoted to Liza Minnelli's third studio album, There Is A Time. There Is A Time was Liza's third (and last) album recorded with Capitol Records; again at the 151 West 46th Street studio in New York. Despite its high reviews by critics (including being named "Album of the Year" by Hi-Fi Stereo Review magazine), it failed to chart or sell many copies. The album was recorded between April and May of 1966 (completed on May 2nd) and released November 7th, 1966. It was produced by Marvin Holtzman, and was arranged and conducted by Ray Ellis, who also arranged Billie Holiday's Lady In Satin album. It was released as #ST-11803, and then later reissued circa 1978-1980 by Capitol's Special Markets in an abridged form, which deleted "One Of Those Songs". With the exception of inclusion of the album's songs on The Complete Capitol Collection, the album has never been released to CD. However, it did receive a straight-to-MP3 release by Amazon.com on August 25th, 2009 (link here), including previously unreleased tracks. Some of the best tracks recorded from the recording sessions of There Is A Time never even made it onto the album. Liza was able to well keep up with her sixties contemporaries with songs such as "Everybody Loves My Baby", which would end up making it into her nightclub act in 1965-1966. "The Many Faces of Love" is another fine tune that would have held up strongly with contemporaries, had it of either made it to the album or even as a single. "Middle of the Street" did make it as a B-side, and was co-written by Liza's first husband, Peter Allen. "Come On And Baby Me" sounds more like it's from Judy Garland's era than her daughter's, but is a very fun tune nonetheless. And of course, we must not forget the very first recorded version of "Liza with a Z"; complete with the spoken intro that Liza still uses to introduce the song! The album failed to sell well as it was a more 'experimental' album than anything. Most of the songs were English translations of popular French songs, which - in an era where much of the American-record buying public were teenagers into rock and roll - the country just wasn't ready yet for such innovation. Had she of attempted this album later on, it may have sold better. That said, the album does stand to serve a testament to Liza's versatility and talent.